Home FAQs What is the fluorescent, double-stranded DNA binding dye in the Luna® qPCR master mix? FAQ: What is the fluorescent, double-stranded DNA binding dye in the Luna® qPCR master mix? 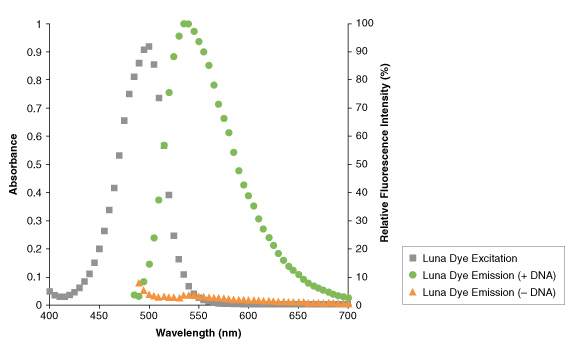 The dye in the Luna qPCR master mix is a fluorescent intercalating dye with similar excitation and emission properties to SYBR®. The dye fluoresces with an emission maximum of ~535 nm when bound to double-stranded DNA (green circles) but displays weak fluorescence in the presence of single-stranded DNA or in the absence of DNA (orange triangles). To enable dye-based detection, select the SYBR Green or FAM channel of most real-time instruments.